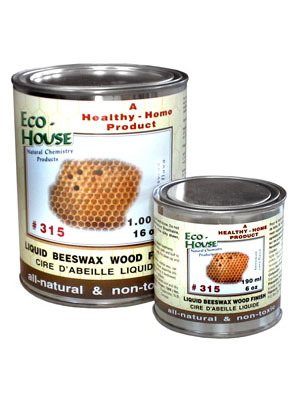 #315 Liquid Beeswax Wood Finish | Eco-House Inc.
Eco-House Liquid Beeswax Wood Finish yields a very fine, anti-static finish on interior wood, cork, natural stone and linoleum surfaces. Its use is only practical on smooth finished surfaces. Ideal on fine furniture and architectural woodwork, which is not exposed to moisture. SKU: N/A. Category: Wax Finishes. Use indoors only on most types of low-use wooden surfaces, as well as for maintenance of waxed floors. For additional protection, the surface can be pretreated with #261 Light Linseed Primer Oil or # 263 Tree Resin & Oil Wood Finish. 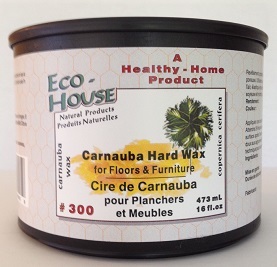 For initial treatment of floors we recommend using #300 Carnauba Floor Wax. 600 sq ft per litre (quart) 200-250 sq ft. per litre (quart) for the first coat and up to 650 sq ft per litre (quart) for additional coats. Product is ready for use and normally does not require any thinning. For clean-up use #115 Eco-House Mild Citrus Thinner. Maintenance and finishing wax with a moderate cleaning effect. Provides a silky, breathable and elastic protection coat. Reduces static loading of surfaces. Does not blister or peel. Easy to refinish by applying additional coats. Wax build-ups and spots can easily be removed with #115 Mild Citrus Thinner. Apply one thin coat by cotton cloth, spraying or wax brush. 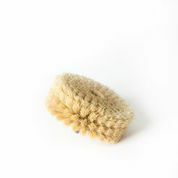 Let dry for at least 2 – 4 hours, then buff surface parallel with the wood grain with a cotton ball, a lambskin disk or a brush. 1.0L / 32 oz., 0.250L / 8 oz.